SMG Wake in Buford, Georgia is now wakeboarding behind Porsche's!!!! 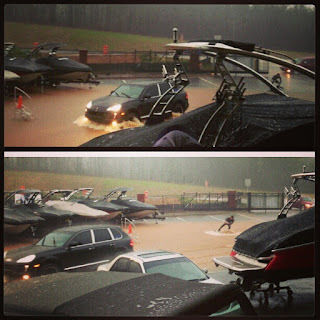 No rain can stop a Mastercraft dealership in GA from pursuing their passion of wakeboarding. A little flooding, an AWD Porsche Cayenne, a tow hitch with 20ft rope, and a Liquid Force wakeboard. I would have more fun wakeskating behind it.